I have been using an eGalax Touchscreen monitor with my Raspberry Pi, for a while. With the new Banana Pi board, I wanted to use the same eGalax TS Monitor and try my web kiosk project. After a lot of research and trials,I finally came up with a much more straight forward and simple tutorial, that explains the steps, as in detail, as possible. 2A power supply via microUSB DC IN. Download the “Raspbian_For_BananaPi_v3.1” file from here and burn it on a good SD card with sufficient space(at least 4GB) and speed(at least class 4). If you need help in installing the image onto the SD card, follow the instructions given here. Verify if the SD card is bootable or not. While booting, you should see the green led on the board blink often and texts start appearing in your monitor and finally a Desktop interface appears. Shutdown the bananapi and insert the SD card in your computer’s SD card reader, running a linux OS. Now, we are ready to start building the modified OS kernel. u-boot-tools. You can remove the uboot-mkimage from the install list. Create a directory where you will build the OS. It will download bananapi packages from git, which took about 1-2 hours on my system and then menuconfig would open automatically. Mark the “USB Touchscreen Driver” option as built-in by pressing the ‘Y’ key, i.e. a * symbol in the s alongside the option, should appear. NOTE: Do not select the “EETI eGalax multi-touch panel support” option. Press ESC key again and again, until you get a dialog box asking if you want to save the configuration changes. Select the YES option. The build will continue and complete, in a few seconds. It will build the USB touchscreen driver into the kernel and take about 10-15 minutes(as in my system) to complete. Unmount/Eject the SD card and boot it with Banana Pi. Check if, your touches on the Desktop screen, moves the mouse cursor and then use your calibration program(for eg. eCalib), if necessary, to calibrate the TS inputs. The fastest way to start writing wxWidgets and C/C++ code is to get the CodeLite IDE. Its open source, free and supports multiple OSes. And add the Boost C++ library into the mix, you can build some really good cross-platform applications. While, wxWidgets comes pre-configured with CodeLite installer , for Boost, we need to manually link up stuff. 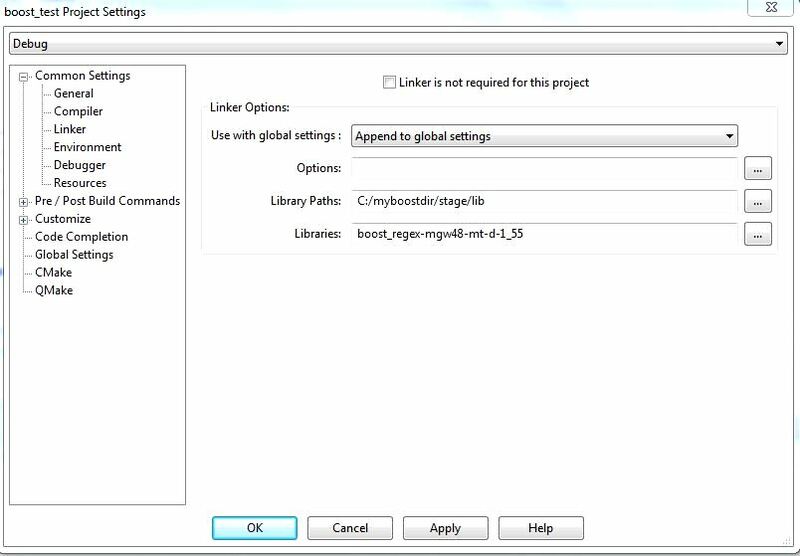 Here’s the clear and up-to-date information on how to setup boost with codelite, in Windows. Download the “CodeLite 5.4 Installer for Windows (8, 7, Vista and XP) with MinGW TDM-GCC 4.8.1 included” package located here(http://downloads.codelite.org/). Download a suitable version of “7z for Windows” from here(http://www.7-zip.org/download.html) and Install it on your system. I recommend 7-Zip 9.20 version. In “Libraries Paths” textfield, fill in the path above, i.e. C:\myboostdir. Click “Ok” and close the dialog box. In CodeLite , Press Alt+W and then N, to Create a New workspace. In the “New Workspace” dialog box, fill in the “Workspace name” and select a proper path for the project. Again, preferably the project path should not contain any spaces and parentheses. Then, in the new workspace, press Alt+W and then P,to Create a new project. In the “New Project” dialog box, select the Template->Console->Simple executable(g++) and fill in a project name in the “Project name” field and click on “Ok”. In the workspace view, select the main.cpp file and paste the below code. Press F7 to build the project. * If you see no build errors, you’re good to go, to the next step. * If you see 1 or 2 warnings, especially pertaining to the boost headers, ignore them. (Reference: http://www.boost.org/doc/libs/1_55_0/more/getting_started/windows.html#errors-and-warnings) else you should look at the steps 1 to 5 above again. * Press Win + R . In the Run dialog box, type in “cmd”, without quotes and press enter. * cd to the directory where the project was created in. * cd to the Debug directory. If you get the output as in image above, you have setup codelite correctly, so far. If you don’t check the code carefully or review the steps 1 to 7. NOTE:The above b2 command will setup basic libraries to use with boost.asio. Go to the workspace view and there select your “Project” and right-click on it. Go to the “Settings” menu item. In Settings dialog box, edit the “Library Paths:” and the “Libraries:” as shown in the screenshot below. Press “OK” and close the dialog box. In the open cmd window, cd to the directory where the project was created in. If you see the output as shown above, you have a working boost + codelite system. Congratulations! Please do drop in a comment and let me know how it goes. The next thing I had to do was configure the eth0 interface on my RasPi and assign it a static IP. Where, 193.168.137.1 is my gateway, which would help me to connect my RasPi on LAN, with internet. Save the file and exit the file editor. If it pings, then, ethernet interface is ready to use, else you should reboot RasPi and retry pinging again. I built the RTC circuit. Now, I had to start using the “RTC to keep time, in Raspbian OS”! Well,after a bit of digging and experiment, here’s what I did. I used a PCF8563 RTC with Raspberry Pi Model B, running latest version of Raspbian OS (Release date: 2014-01-07). NOTE: RTC PCF8563 is supported in the latest Raspbian OS kernels. No need to build a custom kernel. Second, you need to configure to load modules at startup. If your h/w is working you should see a 0x51 in the output of the above command. date -s "MMM DD HH:MM:SS"
Where, MMM=first 3 letters of months, DD=new date and HH:MM:SS = 24 hr format hours:minutes:seconds. You should enclose the parameters, within double quotes. For more information check man page of date. For more information about hwclock, refer the man page.